The accessory navicular is an extra piece of bone or cartilage just above the arch on the inside of the foot. 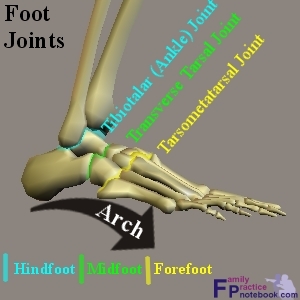 It sits next to the navicular tarsal, which gives it its name, where the posterior tibial tendon attaches to the bone before continuing to the underside of the arch. The little bone is a congenital anomaly, you are born with it. If the extra tissue doesn?t cause any problems, you may never know it is there. You can, however, develop the painful condition called accessory navicular syndrome. This occurs when the extra bone or the posterior tibial tendon surrounding it becomes irritated. Trauma from a sprain, friction from footwear, and overuse can all inflame the tissues. This can result from any of the following. Trauma, as in a foot or ankle sprain. Chronic irritation from shoes or other footwear rubbing against the extra bone. Excessive activity or overuse. Many people with accessory navicular syndrome also have flat feet (fallen arches). Having a flat foot puts more strain on the posterior tibial tendon, which can produce inflammation or irritation of the accessory navicular. Many people with an accessory navicular do not experience symptoms, however some may notice a bump and/or swelling on the inside of the foot just above the arch. They may also experience pain in the middle of the foot, particularly with physical activity. To diagnose this disorder doctors often ask questions relating to symptoms, evaluate the foot by pressing on different areas to evaluate discomfort, watch the patient walk, evaluate foot structure, and most likely take x-rays.